Its been a while since I’ve done a review post+video. I totally enjoy watching honest and non-sponsored REVIEW videos and I think its a great way to give a full, complete details about a product once you’ve tested it. I hope you enjoy watching this video and you also have a post review below which you can check out. But in the video you can see me applying the foundation, some before after effects and some secrets about this famous gem. Nothing is as convincing as a good makeup base when you are going to doll up. It is so important to invest in a good foundation that would not only enhance the complexion but will add a beautiful touch to it. Estee Lauder is surely a well-renowned brand in the Indian market and the Double Wear Stay-in-Place Makeup Foundation has been one classic raved product, well-praised by various beauty gurus across the country. What makes it stand out is the claim to provide a flawless finish that stays looking fresh and natural through heat, humidity, and nonstop activity. So, read on to know whether it deserves such hype or not. PACKAGING – The foundation is housed inside a thick walled translucent rectangular glass bottle with a golden screw cap. While the bottle is small and compact, the product dispensing abilities are certainly not very travel-friendly. It has an open mouth, devoid of any nozzle or pump and if you are in a hurry, you might spill extra amount as well. Also, chances are that if the bottle is accidentally spilled, you’re going to lose a hefty amount of product due to spillage. Overall, the packaging isn’t a mess but not very travel friendly. COVERAGE – The coverage of the foundation is medium to buildable. For high coverage, you need a neat two layers. It effectively covers the minor pigmentation and acne marks but not the deeper ones for which you need a concealer. It evens out the skin tone really well, giving a flawless natural look but too much of layering can make it look cakey. The coverage, though medium, doesn’t look artificial, if you use a proper application technique. TEXTURE – The consistency of the foundation is liquid is general sense but not runny – it somewhat between thick and thin. The texture is tailor-made for oily to combination skin. A good nourishing and hydrating moisturizer is necessary, especially for dry skin. If the skin is not moisturized, then it has the tendency to cling on to the dry patches or accentuate the fine lines as well. Thus, make sure to moisturize the skin as per your skin type before application. Texture is also super-blendable and it takes some time to set, so you don’t need to work fast. APPLICATION – Sometimes, even the best foundations turns out dull and lifeless if not applied properly. However, this one is easy to apply. You can very well blend with the fingers as well or use a brush or sponge accordingly. It spreads well on the face and easy to blend onto the skin when used a good makeup sponge. Overall, the blending factor isn’t very hard and will suit the beginners as well. I love the fact that it can be easily blended with your fingers. FORMULA – The Foundation is well endowed with SPF 10 and provides a sun protection as well to the skin. It doesn’t melt down with sweat and humidity (the typical Indian summer) and thus surely has a long-wearing formula as claimed by the brand. After application, the foundation takes time to set down and gives a natural finished look to the skin. It is also transfer proof and water proof. FINISH – The finish is surely matte as suited for oily skin but not a dry matte finish. It looks impeccable and doesn’t clog the pores. Having said that, it will surely not break you out and safe for the sensitive skin as well. The oil control factor is there and prevents the skin to look messy and muddy after long hours as well. PHOTOGRAPHS – The foundation contains SPF 10 which is low and so we assume that it will not cast a whitish appearance to the skin but unfortunately it does sometimes. It photographs well in mixed lighting. But in artificial light it can stand one. One solution for this problem is that you can blend the product in your neck area. OXIDATION – The foundation doesn’t oxidizes at all which is a great thing for a long wearing foundation. Hence, you can exactly go for the right shade for your skin. STAYING POWER – The foundation surely commands a commendable staying power as the name suggests. It stays on the face for a good 8-9hours without fading and gives a spotless look to the skin. for the removal, you surely require a good oil-based cleanser to remove every layer of it from the face at the end of the day. The consistency is liquid and spreads well on the face. Best suited for oily to combination skin. It can be applied and blended with fingers, brush or even a sponge. It is transfer proof and water proof. Gives a matte finish and takes time to set. Doesn’t oxidizes on the skin. It commands a commendable staying power of 8-9hours. May accentuate dry patches if not moisturized the skin well. Packaging is messy with no pump or nozzle. Super Oily skin beauties may need to set it with translucent powder. Can stand out in pictures. Not all shades available here in India. Final Verdict : Those looking for high coverage foundation may like this products. Looks great if you find your perfect match shade. Also I like the staying power of this product. 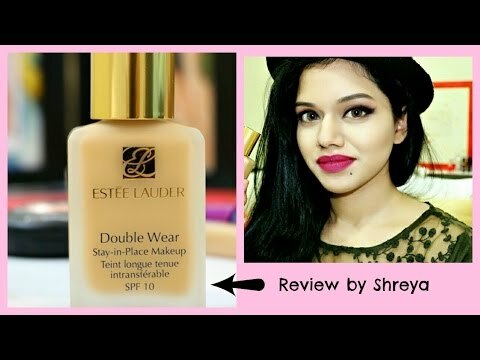 Estee Lauder Double Wear Makeup (Foundation) Review ! Amazing video ….totally enjoyed watching it ! You look super quite in the video. I enjoy watching your videos. Also liked how you have explained everything in detail even in the post. Have heard some great reviews on this one. Would love to give it a try. This is such a heavy duty foundation. Wish it wasn’t so matte.